Our inventory includes Polyvinyl chloride (PVC) belting products up to three meters wide, including food grade PVC belting with capped edges, blue PVC covered belts COS & CBS, HF welded profiles and more. UBR’s expanded PVC offering includes slab widths up to three meters. Food grade PVC belting with capped edges is now available from UBR Blue PVC covered belts COS & CBS, is now in Carmichael’s stock. 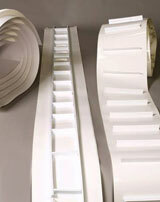 HF welded profiles are available for all PVC belting.